building blocks that make up proteins. The general structural formula of 2-amino-carboxylic acid is RCH(NH2)COOH. The general structure of of 2-amino-carboxylic acid is shown in figure. The R group is the part of amino acid which can vary in different amino acids. The simplest amino acid is glycine, aminoethanoic acid, in which R is an H atom. Under certain conditions the amine group of one molecule and the carboxyl group of a second can react, uniting the two amino acids by an amide bond. Amide linkages between amino acids are known as peptide bonds, and the product of peptide bond formation between two amino acids is called a dipeptide. The peptide chain may be extended to incorporate three amino acids in a tripeptide, four in a tetrapeptide, and so on. Polypeptides contain many amino acid units. Proteins are naturally occurring polypeptides that contain more than 50 amino acid units—most proteins are polymers of 100–300 amino acids. Amino acids are classified as α, β, γ and so on, according to the location of the amine group on the carbon chain that contains the carboxylic acid function. 1-Aminocyclopropanecarboxylic acid: an α-amino acid that is the biological precursor to ethylene in plants. 3-Aminopropanoic acid: known as β-alanine, it is a β-amino acid that makes up one of the structural units of coenzyme A.
acid and is involved in the transmission of nerve impulses. Although more than 700 different amino acids are known to occur naturally, a group of 20 of them commands special attention. These 20 are the amino acids that are normally present in proteins. Essential amino acids must be obtained from the diet, whilst non essential amino acids can be synthesized in the body. 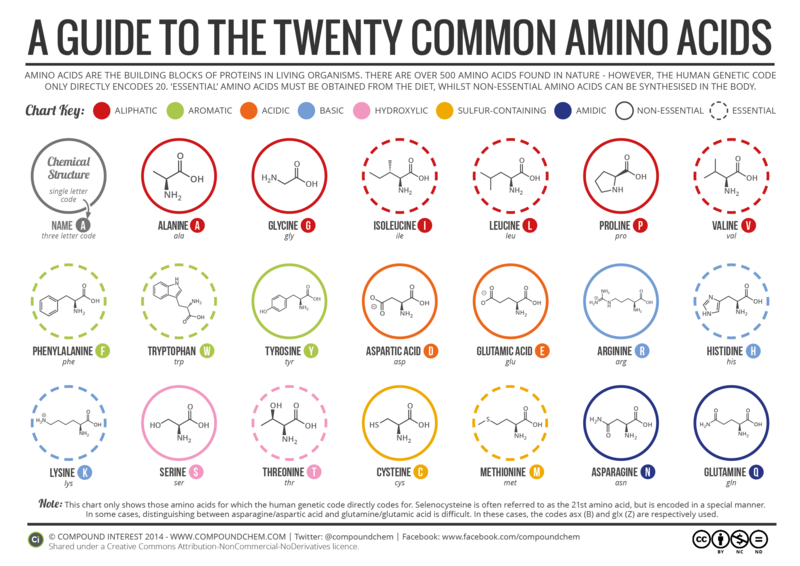 Here I’m going to share a cool infographic from Compound Interest on a brief guide to the twenty common amino acids. In the following infographic following twenty common amino acids are shown.